Available in wide range of shapes and sizes. 99% Safe is Meaningless; Safety has to be 100%, All Time! Safer, smarter, superior therefore the All Time Best. This stylish, lightweight and vesatile range of containers is the ideal way to store your cooking ingredients. They are calibrated for easy mesurment, and their special nesting feature makes them easy to store. 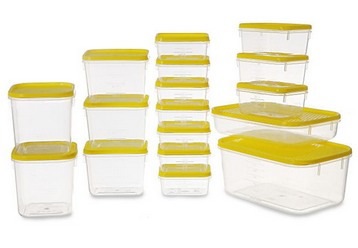 Polka containers are designed in a modular manner and are perfect for fridge or ambient storage. This are available in different sizes, so you can choose the perfect container for your every need. Ideal Uses - Polka Containers are versatile and are commonly used to store a wide variety of items - ranging from food and cooking ingredients to cutlery, stationery, art supplies, jewellery and Knick-Knacks,etc.. A one stop shop for all your kitchenware needs at all times! 99% Safe is Meaningless; Safety has to be 100%, All Time! Safer, smarter, superior therefore the All Time Best. Welcome to your one stop solution to buy all kinds of kitchen essentials online. We are one of the largest manufacturers of plastic items in the world. We have everything ranging from kitchen containers, chopping boards, to all kinds of kitchen tools and kitchen aids. We guarantee that all our items are made from quality materials. So what are you waiting for? All your kitchen essentials are just one click away now. Fill up your cart, give us your address and we'll deliver it to your kitchen as soon as we can.